Futures are formed in different ways for different people. For Logan Cammarata, it started with a gift from his grandparents. “Since I was six, I’ve always known I loved history. My grandparents bought me a book on Egypt, and ever since then I was hooked,” said Cammarata. Since that first book, however, he has found his calling in Civil War history and loves to visit the various battlefields and historical sites here in Tennessee. Cammarata, a Trenton native, is in his third year of college, but will graduate in the fall of 2013, a semester early. 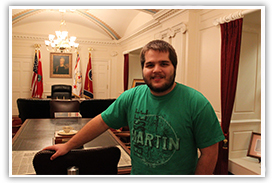 He is eager to start a career as a historian with the state park service and has already applied for a summer position. He found a sense of home at UT Martin as a freshman, which has helped him feel comfortable on campus since then. “It (UT Martin) is just big enough to where you can get pretty much whatever you want, but small enough that you feel like you’re getting an individualized education,” he explained. However, his college search started not with UT Martin’s size or hometown feeling, but with a single professor. 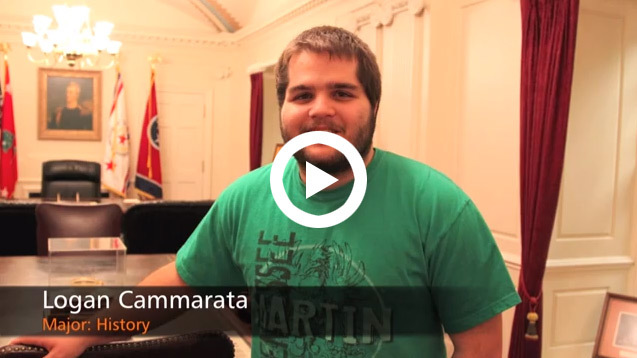 Cammarata appreciates how his history professors have prepared him for the rigors of a historical profession. “I feel like they (the history professors) really expand your knowledge, your ability to decipher primary and secondary sources, and your ability to write,” he said, noting how his high school teachers often gave up on his writing skills.